Following two months of increases, employment fell by 88,000 in January. Part-time employment declined (-137,000), while full-time employment was up (+49,000). At the same time, the unemployment rate increased by 0.1 percentage points to 5.9%. On a year-over-year basis, employment grew by 289,000 or 1.6%. Gains were driven by increases in full-time work (+414,000 or +2.8%), while there were fewer people working part time (-125,000 or -3.5%). Over the same period, hours worked rose by 2.8%. In January, employment declined for core-aged women (25 to 54 years old), as well as people 55 and older and youth aged 15 to 24. There was little change for core-aged men. 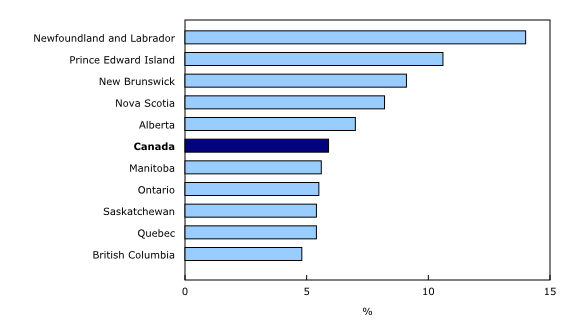 The largest employment declines were in Ontario and Quebec. There were also decreases in New Brunswick and Manitoba. Declines were spread across a number of industries, including educational services; finance, insurance, real estate, rental and leasing; professional, scientific and technical services; construction; and health care and social assistance. On the other hand, employment increased in business, building, and other support services. In January, the number of employees fell in both the private and public sectors, while the number of self-employed workers held steady. Employment among core-aged women fell by 45,000 in January. Their unemployment rate was little changed at 4.9%, as fewer women participated in the labour market. On a year-over-year basis, employment for this group was virtually unchanged. Among people aged 55 and older, employment fell by 24,000 in January, with all of the decline in part-time work. Their unemployment rate was little changed at 5.3%. On a year-over-year basis, employment for this group rose by 187,000 (+4.9%), partly due to the continued aging of the baby-boom cohort. The pace of employment growth over this period was faster for women (+7.0%) in this group than it was for men (+3.2%). For youth aged 15 to 24, employment declined by 22,000 in January, as full-time gains were more than offset by part-time losses. The youth unemployment rate was little changed at 10.9%, but was down 2.2 percentage points compared with January 2017. On a year-over-year basis, youth employment held steady. Employment for core-aged men was little changed in January, as full-time increases were offset by part-time declines. The unemployment rate for this group was little changed in the month, at 5.0%, but was down 0.9 percentage points compared with 12 months earlier. On a year-over-year basis, employment for core-aged men was up by 75,000 (+1.2%), driven by gains in full-time work. Employment in Ontario declined by 51,000 in January, entirely due to losses in part-time work. The unemployment rate was 5.5%, little changed as fewer people participated in the labour market. Compared with January 2017, employment in the province grew by 104,000 (+1.5%) and the unemployment rate declined by 0.9 percentage points. 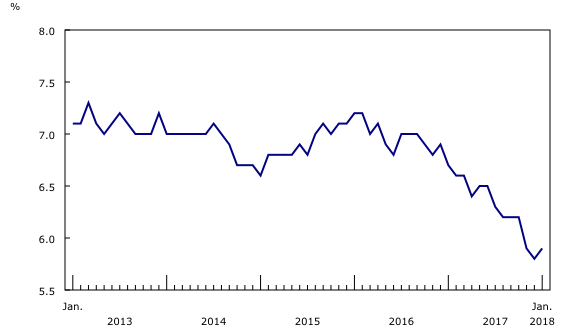 Following three months of increases, employment in Quebec fell by 17,000, driven by part-time declines. The unemployment rate increased 0.4 percentage points to 5.4%, as more people searched for work. 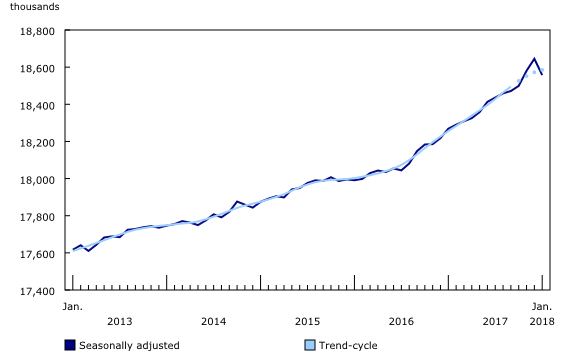 On a year-over-year basis, employment in Quebec rose by 71,000 (+1.7%) and the unemployment rate was down 0.9 percentage points. Employment fell by 5,800 in New Brunswick, and the unemployment rate increased 1.3 percentage points to 9.1%. On a year-over-year basis, employment in the province was little changed. In Manitoba, employment fell by 3,600, as part-time gains were more than offset by full-time losses. The unemployment rate was unchanged at 5.6%, as fewer people were participating in the labour market. On a year-over-year basis, employment in the province grew by 7,100 (+1.1%). Overall employment in Alberta was little changed in January, as large part-time declines were mostly offset by full-time increases. Compared with 12 months earlier, employment in the province rose by 46,000 (+2.0%), entirely due to increases in full-time work. Over the same period, the unemployment rate in Alberta was down 1.7 percentage points to 7.0%. In educational services, employment fell by 20,000 in January. Compared with 12 months earlier, employment was at virtually the same level. Employment in finance, insurance, real estate, rental and leasing declined by 18,000 and was little changed on a year-over-year basis. There were 17,000 fewer people working in professional, scientific and technical services in January. Despite this decline, employment in this industry grew by 34,000 (+2.4%) compared with 12 months earlier. In construction, employment fell by 15,000 in January, while it rose by 33,000 (+2.4%) on a year-over-year basis. Employment in health care and social assistance declined by 11,000 in January. On a year-over-year basis, there was little change in this industry. There were also declines in natural resources (-5,900). Employment in this industry was virtually unchanged compared with January 2017. In business, building and other support services, employment rose by 11,000. On a year-over-year basis, employment was little changed. In January, the number of employees declined by 71,000 in the private sector and by 41,000 in the public sector. On a year-over-year basis, there were 109,000 (+0.9%) more private sector employees, while public sector employment was little changed. Self-employment was little changed in January, but was up 141,000 (+5.1%) on a year-over-year basis. Adjusted to US concepts, the unemployment rate in Canada was 4.9% in January, compared with 4.1% in the United States. The unemployment rate for both countries trended downward in the 12 months to January. The labour force participation rate in Canada (adjusted to US concepts) was 65.5% in January, compared with 62.7% in the United States. On a year-over-year basis, the participation rate declined by 0.3 percentage points in Canada, while it was down 0.2 percentage points in the United States. The US-adjusted employment rate in Canada was 62.2% in January, compared with 60.1% in the United States. On a year-over-year basis, the employment rate rose by 0.2 percentage points in both Canada and the United States. A standard revision was applied to the Labour Force Survey (LFS) estimates, as announced in The Daily on February 2. Using the latest seasonal factors, seasonally adjusted estimates from the LFS were revised from January 2015 to December 2017. The LFS estimates for January 2018 are for the week of January 14 to 20. The next release of the LFS will be on March 9. A more detailed summary, Labour Force Information (Catalogue number71-001-X), is now available for the week ending January 20. The updated Labour Market Indicators dashboard (Catalogue number71-607-X) is available. This interactive dashboard provides easy, customizable access to key labour market indicators. Users can now configure an interactive map and chart showing labour force characteristics at the national, provincial or census metropolitan area level. To enquire about the concepts, methods or data quality of this release, contact Andrew Fields (613-951-3551; andrew.fields@canada.ca), Gordon Song (613-793-2392; gordon.song@canada.ca), or Client Services (toll-free: 1-866-873-8788; statcan.labour-travail.statcan@canada.ca), Labour Statistics Division.